My first ever graphic novel was only started because my pal Rob Schrab had this tiny publishing company where he made SCUD the Disposable Assassin. After twenty years in print, the final run sold out and as I looked through the book I kept feeling like we should clarify some of the artwork that was hard to read. 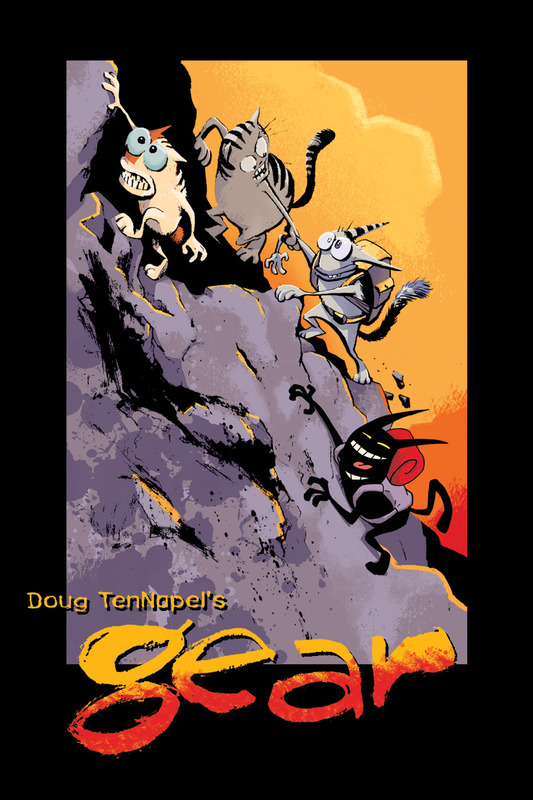 Many fans of Nickelodeon’s Catscratch don’t know that the animated series came from my first graphic novel. We took the three main cats from the book and put them into a new cartoon world. Since they acted like old-time cartoon characters, it made sense to pay tribute to classic Warner Brothers cartoons with our series. Click here to see a rare pre-production video of Catscratch! The reworking of GEAR was originally going to be a small project that might take one month but after we got into it the project ballooned to about three months, with Katherine pulling sixteen hour work days to hit our deadline! This is a live editing session for the new GEAR book! There is nothing like finishing a book. It’s like all of this pressure builds as a deadline approaches and there is a frantic flurry of work that suddenly comes to a finish. The book has a life of its own once it goes to the publisher, and then the readers decide the life trajectory of my stories. They give feedback months after its finished and then we find out if it was a success or not. Pre-order the new edition on Amazon!